Lady Gaga Fame inspired by her images and create for her special outfits. Lady Gaga Fame 100ml. 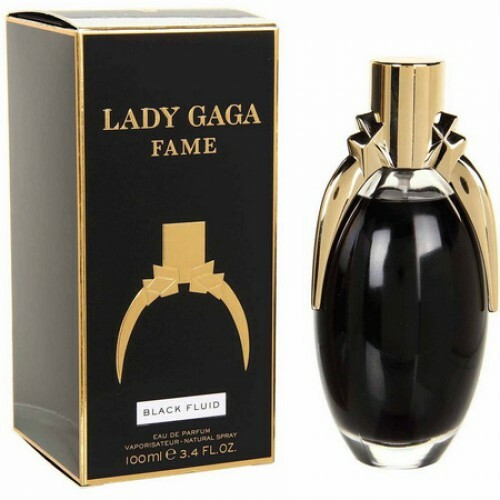 Eau De Parfum - The winner of "Grammy" and multi-platinum album, the singer Lady Gaga has announced the global launch of its first fragrance Lady Gaga Fame. Fragrance defies the rules and traditions of perfumery. Unique flavor lies in its unique architecture. Traditionally, sound fragrance is built on the top notes, heart notes and loop. However, Lady Gaga Fame has an unusual structure, called a technology push-pull. Components are constantly interacting with each other, creating a chaotic new chords. Each note is artfully combined with the rest due to the unique properties of the ingredients that make up the perfume. Perfume plays on the skin, giving rise to unique metamorphosis every second of their sound. Flavor composition is described quite elegantly: " Tears of belladonna, chopped heart of tiger orchid with black veil of incense, dust and apricot mixture essences of saffron and honey drops." Lady Gaga herself says that though perfume and created for women, she liked many of her gay friends. Furthermore Fame - the world's first black perfume water, which becomes transparent and invisible spray. Lady Gaga knows how to surprise their music, behavior and of course images. Many designers feel very lucky to wear an unusual star, they are inspired by her images and create for her special outfits. Was no exception and the American shoe designer Brian Atwood. To celebrate the release of flavor Fame singer released designer boots that resemble a bottle of perfume. Black, huge high heels with gold inserts, they are perfect image of the singer. Gaga has repeatedly been seen in these boots on various events. Let's see who, besides her, dare to wear them.